Is This “Just” Another Arbitrage Opportunity? I love organic search. The idea of building up from nothing to create something which is fairly sustainable and eventually has its own momentum behind it is an awesome feeling. But you have to start somewhere. 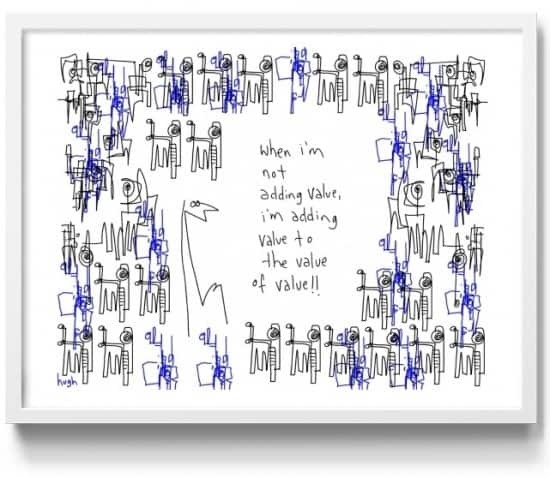 Adding value is a great thing to say, but the phrase is often meaningless. Even if you do something that adds value to the web then many people will start cloning it right away, and if they have more distribution than you do, they will take ownership of your idea. This can even happen to established reputable webmasters with a decade of experience! If your goal is to keep adding value and hope that someone eventually notices, you are probably in for a sad surprise. More likely than not the person who notices and cares the most will compete against you. The business world is full of fake investors, fake friends, fake partners, and publicity stunts. That perhaps sounds cynical, but it is a reflection of how the web works. In other words, creating value by itself is a hollow and pointless process. you can talk about how everyone entrepreneur is so focused on building ad-supported businesses, but that’s not going to make the penny gap disappear. Ultimately,pricing and demand are consumer driven. The economics of online media are based on the foundation of the market and individual firms only have a few levers. So how does one go about creating lasting profits? It is not just about creating strong rankings. Indeed, our company has competitors with larger businesses who have worse rankings. It is not just the rankings that matter. What really matters is how well you connect with people and how much they trust you. As an individual, you can only connect with so many people, so you may as well choose who you want to be connected with. As we hire more people we can grow, but one of the easiest ways to add lasting value is by adding constraints to your strategy like scarcity. Almost everyone who has a website which offers valuable links has been sent hundreds to thousands of link request emails, and almost everyone is aware of the value of links. So if you want to compete long-term, the key is to help foster brand evangelists and people who care enough to stand up for you when someone else abuses you for their own gain. If you don’t show up for work for a few days or you don’t update your blog for a month, you want people to send you complaints asking what is wrong. If someone’s account gets locked out while you are sleeping, you want to wake up to 3 emails from them from the few hours you were asleep because they are telling you how much they care about what you offer. If you are selling something, you need to create far more perceived value than what you charge because the only time people will purchase is when there is a perceived double inequality of value (people don’t make a $100 investment hoping to get exactly $100 back.) So how do you make people really care about what you do? Rather than focus exclusively on value, focus on emotions. The market for something to believe in is infinite. Today, I read a sales message from someone slagging SEO as something that will eventually become irrelevant. The most interesting part of his revelations was the exact same guy was warning people off of SEO with the exact same sales material back when I first got started in the industry. Anyone using his system (no matter how ugly the site designs look or how poor the content) is doing things the right way. Whereas almost everyone else is a spammer whose day will soon come. Lucky for me (and many smart people like you), we ignored his advice, and as a result we have made millions in revenues doing something that was allegedly impossible or about to end. To have lasting profit margins, you have to see value where others do not see it. When the Google founders started Google the conventional wisdom was that your search only needed to be 80% as good as the competition’s to be good enough. How did that work out? I am happy when I see people denounce SEO as useless because that means the market opportunity will exist that much longer for you and I. Once everyone concedes to the value of SEO, then there will be limited competitive advantage. Most businesses are lucky to run a 10% profit margin, and there are some online businesses operating at above 90% margins. Will that last forever? Of course not. How could it? Business is a lot like life. “On a long enough timeline. The survival rate for everyone drops to zero” – Fight Club. Businesses and business models have seasons. Maybe we are in the late summer to early fall of the SEO industry lifetime, but it’s hard to tell. I thought that was where we were when I got started back in 2003. And yet things couldn’t have went any better over the last 7 years – even in the face of the worst world-wide economic crisis in 70 years. What if SEO does one day become less viable? The presumption from those who rip on it is that all SEOs are a one trick pony and that one day we will be standing in a line waiting on our bread. But even if the market does grow more complex, it doesn’t mean that you have lost the money you have already made, or that the websites you have built up are suddenly zeroed out in the marketplace. I look at SEO as a chance to increase profit margins for existing businesses and as a chance to get new businesses into the search game. If after 5 years of being in the game, the site hasn’t developed beyond being just an SEO play then the site owner wasn’t very interested in building a long-term business. But as you increase your cash flow and build relationships in the marketplace, you become your own leading competitor as it is up to you if you want to develop just another arbitrage play, or something that stands the test of time.